I love Aunt Millie’s bread. I first found it by accident at Kroger. I was looking for bread that didn’t have HFCS in it and Aunt Millie’s was the only brand of what seemed like a thousand that didn’t have it. I picked up that loaf of bread, went home, and made a peanut butter sandwich. Ever since that day, I’ve been buying Aunt Millie’s. 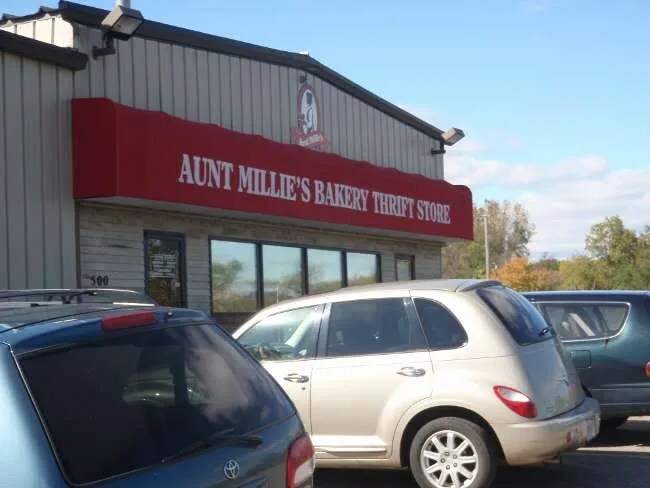 If you buy Aunt Millie’s in most stores, it’s pretty expensive. Up until J and I moved in together, I had always bought store brand for $.99. I never really cared about nutrition information until J was kind enough to point out to me what it all meant. 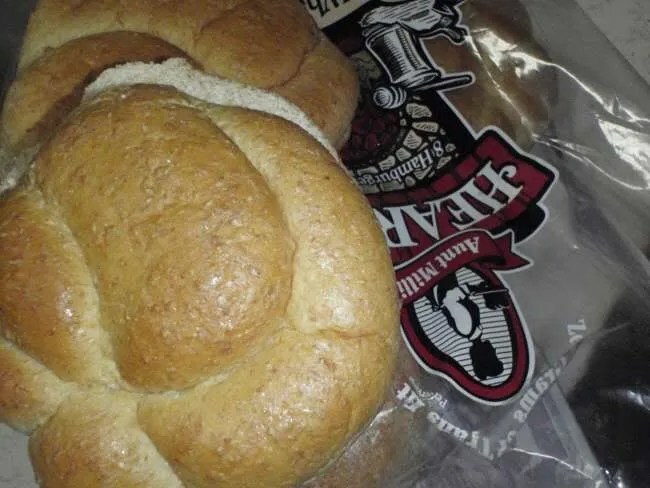 I hated the “healthier” bread. It had no taste and it was full of holes. Aunt Millie’s has a couple different breads that are 1 point on the Weight Watchers scale and they taste great. Again, price can be an issue. When we shopped at Meijer the other night, I picked up a loaf for almost three bucks. We needed bread, so I bought it, but I was really hoping I could find some place else that sold it cheaper. Yesterday, I found the post office on Miller Street to mail off the “thank you cards” from our wedding. I went a different way on my way home just to see a little more of Kalamazoo and try to figure out where things are. As I was making my way back towards Westnedge, I accidently found what I was looking for. Aunt Millie’s Bakery Thrift Store is on Cork Street in Kalamazoo’s Milwood neighborhood. It’s a small storefront that looks to be attached to a factory or at least distribution center. The store sits off the road a little bit and it’s even harder to get to know as Cork Street is under construction. Still, I made my way through the cones and uneven roads to get up to the store. Inside is just bread racks lined up against the walls with almost out of date bread. They had pretty much everything I have ever bought from the Aunt Millie’s line. J wanted grilled cheese for dinner, so I really thought about picking up a loaf of Texas Toast, but I decided against it not knowing when else I would use such large bread (would be great for French Toast if I made breakfast). 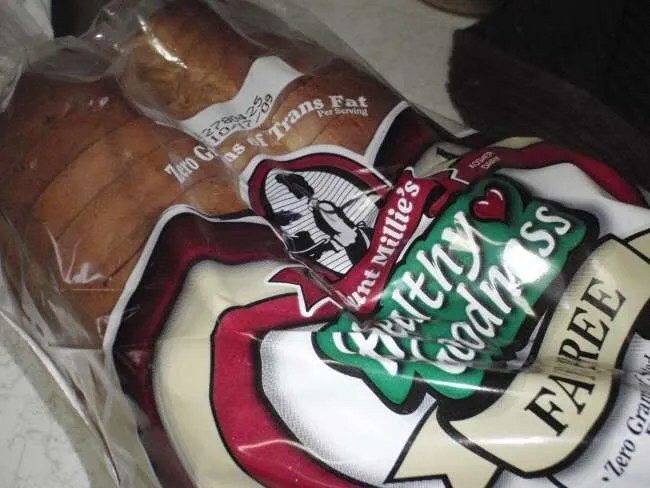 I picked up my usual loaf of Fat Free Multi-Grain Wheat then looked around to see what else I “needed.” I really like their hamburger buns, but I had a hard time finding my usual line. As I was giving up, I found one bag on the bottom of a shelf. Again, I go with the Whole Wheat. They have a line called Aunt Millie’s Hearth that I really liked and that’s what I found. 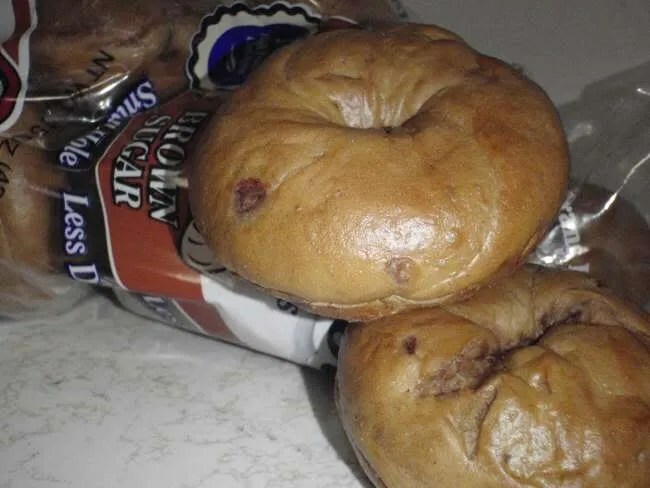 As I was heading to the check out, I saw a bag of mini bagels called Spreadables. I’m not a breakfast person, but I thought J might like them as an out-the-door snack as she leaves for work. They had a brown sugar flavor which sounded good even to me, so I picked them up. I headed to the counter to pay. There’s only one cashier, but there’s not a ton of business at the store. They only accept cash, check, or EBT. No credit or debit cards are accepted, but if you have a little bit of change in your pocket, you can probably afford what you need. The three bags of bread cost under $3. Seriously. I just paid almost that much for one loaf of bread at Meijer. Again, these loaves are very close to their sell-by date, but this stuff keeps for a while. It’s not the freshest Aunt Millie’s bread you’re going to get, but it’s still delicious and, by far, the best bread on the market. So glad I decided to take that detour on the way home yesterday. Even though it’s a few miles out-of-the-way, it is more than worth the trip. 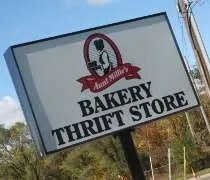 There was am Aunt Millie’s thrift in Lansing. You must have missed it!! I went to the one in Lansing a couple times, but it’s so far out of the way out by the airport. We could get Aunt Millie’s bread at Horrocks for about $0.25 or $0.50 more, so that’s where we usually got the bread. The Thrift store was the only place we could find the pita bread though, so I would usually make a trip out there every few months and stock up. How could I forget Horrocks, since I shop there every week. I shop here all the time. I always buy a bunch and then freeze it. They have a ton of Danish for $2.50 each, when you normally would spend $5.00 and this may be a new thing, but they did accept my credit card last time! It’s been a while since I’ve shopped there, so that could be. In case anyone else stumbles upon this 7 years later, they take credit/debit cards now. On Monday everyone gets a discount on the “regular bread” and bagels. (Used to be a senior discount.). Plus they have pies, chips, cookies, and other goodies. Thanks for the update. I actually haven’t been there in quite a while. We moved to the other side of town a while ago.